The Wii is the fifth home video game console released by Nintendo. The console is the direct successor to the Nintendo GameCube. Nintendo states that its console targets a broader demographic than that of Microsoft's Xbox 360 and Sony's PlayStation 3, but it competes with both as part of the seventh generation of video game systems, despite being noticeably underpowered compared to its rivals. A distinguishing feature of the console is its wireless controller, the Wii Remote, which can be used as a handheld pointing device and can detect acceleration and orientation in three dimensions. Another feature is WiiConnect24, which enables it to receive messages and updates over the Internet while in standby mode. The Wii remote and Nunchuk combination can be used to play Super Smash Bros. Brawl, while the Wii remote (turned on its side), the Classic Controller, or a GameCube controller may also be used. Nintendo first spoke of the console at the 2004 E3 press conference and later unveiled the system at E3 2005. Satoru Iwata revealed a prototype of the controller at the September 2005 Tokyo Game Show. At E3 2006, the console won the first of several awards. By December 8, 2006, it had completed its launch in four key markets. The Financial Times reported that as of September 12, 2007, the Wii is the sales leader of its generation, based on sales figures from Enterbrain, NPD Group and GfK. 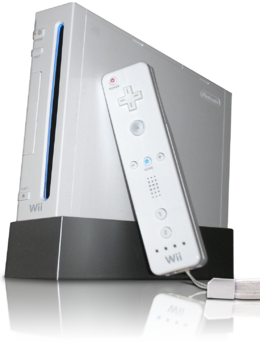 The Wii Mini was released initially in Canada on December 7th 2012. While the console can play Super Smash Bros. Brawl, it cannot play Super Smash Bros. or Super Smash Bros. Melee, as it lacks the online functionality needed to download the former, and it lacks the GameCube controller ports and GameCube memory card slots needed to play the latter. The lack of GameCube controller ports also prevents the use of GameCube controllers with Super Smash Bros. Brawl. Though it was only available in Canada at launch, it was later released in Europe on March 22, 2013, and in the United States on November 17, 2013. Super Smash Bros. Brawl is a Super Smash Bros. game released game for the Wii in 2008. Backwards compatibility allows for Super Smash Bros. Melee to be played on the Wii, but with GameCube controllers only. Also, Super Smash Bros. for the Nintendo 64 has been released on the Virtual Console in Japan, Europe, America and Australia for 1000 Wii Points. This makes it possible, for the first time, to play all previous Smash Bros. games on the newest game's home console, as well as the first time any past Smash game has been playable on a newer console. The Wii Mini, depicted with a red Wii Remote Plus and Nunchuk. A Wii Remote connected with a Nunchuck. ↑ Wii: The Total Story. IGN. Retrieved on 2006-11-20. Wikipedia has an article on Wii. This page was last edited on March 11, 2019, at 21:39.